Opera’s most popular double bill comes to dramatic life in this broadcast with a lineup of great singing actors, led by the magnetic Zinka Milanov as Santuzza and the incomparable Richard Tucker as her beloved Turiddu, in Mascagni’s Cavalleria Rusticana. 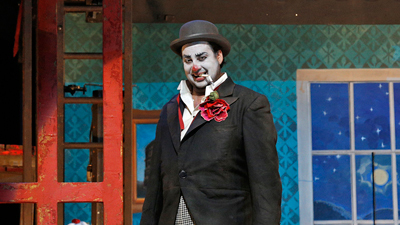 Pagliacci’s iconic clown, Canio, is sung by Kurt Baum, opposite Delia Rigal as Nedda—his young wife whose infidelity leads to tragedy and death, in a thrilling scene of life imitating art. The legendary Leonard Warren is Tonio.